Exciting and inspirational news for Stockwell. 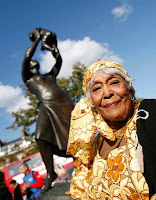 The first ever statue in England of an African-Caribbean woman was unveiled on Wednesday (8 October) in the Stockwell Memorial Gardens. It celebrates the contribution of Caribbean women, and indeed all women to British society. The ten foot high bronze statue of a woman holding a baby is based on the poem Bronze Woman which was written by Guyanan-born Cecile Nobrega, who lives locally. Cecile was the guest of honour at the unveiling of the statue, along with Baroness Scotland, and local Councillor Pete Bowyer. The installation is the culmination of a ten year campaign by Ms Nobrega, and was revealed to coincide with Black History Month. Some photos of the event have been posted here and here.